The clothing / fashion industry is the worlds second largest polluter after oil. How can we reduce the impact we have on our planet by our choices of the clothes we wear? - much of the environmental impact of clothing is in the manufacture. - buying fewer items in the long run means less impact at every stage. 3 - Buy clothing that has sustainability or ethical credentials and avoid the cheapest "fast fashion"
- not so easy to do always but becoming easier, and #1 and #2 above always work. - prevents a new item being made, saves you money and you get to still wear your favourite clothes. - there is rarely any need to send unwanted clothing straight to landfill, it can almost always be reused. It is surprisingly difficult to measure the environmental impact of manufacturing many clothing items which can have very complex supply chains. They may be made of more than one kind of fibre from different parts of the world, the production of each of which has its own impacts, these may then be brought together in another country with zips, buttons, thread etc. from somewhere else entirely, dyed and finished with coatings using imported chemicals, then packaged and sold locally or on the other side of the world. Each individual component may be produced in a variety of ways that vary in their impact from relatively clean to highly polluting. The easiest way to reduce your own personal impact however is to simply buy less. Most people in developed countries could probably lose half of all of the clothes they own in drawers and on hangers and hardly notice the difference in practical terms. The environmental impacts are very much concentrated in the manufacturing process, so the fewer items made the less the impact. Even if you have the least environmentally friendly clothes, buying less of them still reduces the impact even of these and in the absence of information about how the clothes were made you can still be certain you are doing something positive. Emotional durability is usually the issue, people get tired of wearing something long before it is worn out, physical durability is generally not a problem. What causes the environmental impact? This may involve intensively growing cotton using such large amounts of irrigation water that it disrupts the flow of rivers, and the addition of chemicals in the form of pesticides and herbicides. Organically grown cotton on the other hand with little or no irrigation has far less impact. It may involve the production of cheap synthetic fibres in highly wasteful, energy-intensive, air polluting processes making garments that shed large amounts of microfibres into the environment when washed and dried. Recycling and resistance to breakdown is an issue with synthetics, many of them will still be around in a couple of centuries or more. Resources can be saved and disposal avoided by using recycled fibres produced with care taken to minimize pollution and by donating or recycling them when the owner has no further need for them. 2 - Dyeing, washing and the application of finishes - to change the feel or properties of the finished garment. This uses large amounts of water and generates large amounts of waste water. Depending on the chemicals used and how the water is disposed of it can have significant effects on the environment. At the worst, poisonous heavy metals and other chemicals are simply discharged into rivers, something that happens where there are minimal or lax controls or where corruption leads to a blind eye being turned. Alternatively where there are good environmental controls and with manufacturers who care about the impact of their products, these processes can be much more benign. Microfibres - it is becoming more and more apparent that plastics of all kinds generate tiny particles that are collectively called microfibres. These can just about be seen by the naked eye though are more often than not overlooked. These have been building up around the planet in all places for years and have reached almost all parts of the world. How much of an impact they are having or may be having is largely unknown as awareness of their prevalence is relatively recent and research is in the early stages. Laundering synthetic clothing and drying in tumble driers generates huge numbers of microfibres that find their way into water courses via sewage treatment plants and into the air. Increasingly clothing has become disposable with some garments being bought to be worn on a single occasion and then discarded. 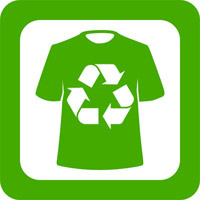 Only 15% of all unwanted clothing is donated or recycled, the rest goes to landfill or is burnt. Natural fibres will break down and rot eventually being fully recycled in the planets' carbon and nitrogen cycles, but synthetics will persist for very long periods, 200 or 400 years has been suggested though as they have not been around for so long, we don't really know. Often garments are made of a combination of materials with polycotton in particular being very common, fibre mixtures make it very difficult to recycle clothes. Greenwash - Also known as "green sheen"
Unfortunately a not uncommon process whereby products or brands are portrayed as being more environmentally friendly than they actually are, by means such as exaggerating positives, not telling the whole truth, hiding the negatives, talking about vague "aims" and "commitments" for the future rather than what they are actually doing now. The purpose of Greenwash is to improve sales by making minimal cost changes that are touted as being "Eco" or "Environmental". Uneven laws in different countries about advertising and lax enforcement can make it very difficult for the average consumer to determine whether or not claims are true and even if they are, whether they have much or any actual positive effect. How do I know what the least environmentally damaging clothing is?! There is no easy answer. Oil based synthetics can be more environmentally friendly than natural materials depending on how they are produced, the environmental footprint of a simple t-shirt can vary widely depending on what it is made of, how the fibres were produced, how the material was dyed and finished etc. 1 - The only foolproof way to know you are having less impact is to buy fewer items, mend them when needed and don't discard them for something new too soon. 2 - Wear more than once before washing, wash at a lower temperature and air dry outdoors. 3 - When you do discard them, pass them on to friends, family or charity. A traceable and transparent supply chain. To readily identify if there are any aspects of the manufacture of a garment that are at odds with the sustainable ethos. Organically grown materials, such as cotton, hemp, wool and bamboo use less polluting practices that are good for the long term health of soils as well as not putting all those chemicals into the environment. Using recycled materials, so reducing the production of new fibres from raw materials, this is particularly relevant with polyester which while is still quite rarely recycled as a fabric, is increasingly being made from plastic bottles. Natural materials. Fully biodegrade so even if they do end up in landfill they will breakdown into compounds that become part of the natural carbon and nitrogen cycles rather than still being around in hundreds of years. Avoiding azo dyes, which can cause environmental damage and can be harmful to work with. Avoiding PFC's perfluorocarbons in waterproof clothing or as stain and dirt resistant coatings. These are harmful to organisms that take them up in the environment and are particularly persistent, the main contamination comes from the manufacturing process. Paying a fair wage to those who make the clothes and ensuring they have a safe working environment. The cheapest clothes are usually made in unsafe factories in developing countries with poor regulation of working conditions and disposal of waste. Garment manufacturers at the lower end of the fashion industry supply chains pay amongst the worlds lowest wages, about 85% of the workers are women. Which garments are "sustainable" and by how much is a very complex question, not all items from a particular brand are equally sustainable, or there may be a sustainable range of a proportion of all items on sale. By virtue of not being the lowest price, quick-and-dirty fast fashion, sustainability doesn't come dirt cheap and while some brands are still very affordable, others are more premium. Almost by definition, sustainable practices result in quality rather than disposable products.